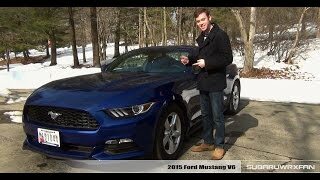 Ford is set to celebrate its 50th anniversary taking a dynamic jump in its geographical availability with the release of its all new, Ford Mustang 2015. For the first time in its history company is prepared to release its model for the England, Japan and Australia. Let us see how this new generation muscular car bestows its new streets with its all new EcoBoost engine and new technologies. Interior of Ford Mustang 2015 to us felt like an aviation-inspired cockpit, especially the nine toggle switches mounted over it. Ford Mustang for this year gets a larger interior specially the trunk, which holds space enough for two golf bags. Darker interior brings with a multi-feature loaded dashboard and center console and three air vents in center while the steering wheel gets a horse emblem featuring an overall retro inspired look. Talking about the features, let us begin with the toggle switches which allow you to quickly adjust steering effort, transmission, electronic stability control settings and engine response. Apart loaded driver assist features include blind spot information system, cross traffic alert and adaptive cruise control as standard while accompanying them is SYNC AppLink that allows the driver to entertain them by synchronizing their smartphones with Ford Mustang 2015. 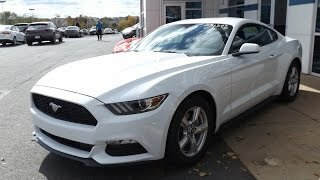 In all the interior of Ford Mustang 2015 is classy amalgamation loaded with features. 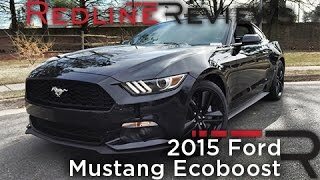 Exterior of Ford Mustang 2015 is an innovative approach by company featuring a lower and wider body. We believe to achieve this target of low ride they have done revision in the roof height while for widening the rear fenders and track got some smart work to give an aggressive muscular stance. Rear windshield gets a sloppy look while we noticed the entire Ford Mustang profile getting a sleeker touch for this model. Apart from these, model also gets new headlight and taillights featuring sequential format with a splitter accompanying them at rear colored same as body. 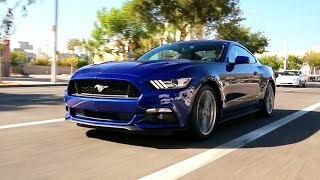 Ford Mustang 2015 brings for its buyers an option to chose from three engines, precisely; 2.3 Liter EcoBoost, 3.7 Liter V6 and most powerful among all 5.0 Liter V8. Beginning with 2.3 liter EcoBoost engine which delivers 305 hp and 407 nm torque, a little behind knocks 3.7 Liter V6 engine that delivers 300 hp and 366 nm torque and the last but the most powerful is 5.0 Liter V8 producing 420 hp and 529 nm torque. All the engines are paired to updated manual gearbox, however option to switch for automatic transmission is also provided which will feature paddles on steering wheel.